Published in the Dover Express, 17 October, 1980. The early part of the 19th century saw a religious revival on a scale never known before in England and Christ Church was the second of a number of churches built in Dover as a result of this. The population was growing at a fast rate and the garrison was being maintained at a level of about 3,500 and yet, with a population of over 20,000, there were only two Anglican churches in the town in the early 1830s. Those of Buckland and Charlton were hot at that time considered to be in the town of Dover and the ancient church at the castle was nothing more at that time than a ruin used as a coal store for the garrison. The two churches serving the Anglican community were the old church of St. James and St. Mary’s in Cannon Street, in which there was seating totalling about 1,500. This was totally inadequate so the Church Commissioners decided to build a new church near the western docks, in Strond Street. Holy Trinity Church, as it was called, was completed and came into use in 1835. It subsequently became one of four Anglican churches destroyed by enemy action during the Second World War. But the building of this new church proved insufficient for the needs of Dover and more were thought to be required. Another factor which led to Christ Church being built was a serious rift in the Anglican community involving the “High Church“ and “Low Church“ factions. In 1842 there was the last of the elections by which vicars of St. Mary's were traditionally chosen. It lasted two days and was strongly contested. The man elected, the Rev John Puckle, was both able and revered but he was known to be “High Church“ and his election caused concern if not ill-feeling in some sections of the Anglican community which was fuelled by the subsequent introduction of pew rents. Mr Puckle was a great one for “restoring" churches and it was his efforts which led to the ruthless demolition and rebuilding of St. Mary’s soon after his election. Only the old tower of the church was left untouched by the work. Permission to build a new church was eventually obtained and a new parish was carved out of part of the old parish of Hougham. The land for the building of Christ Church was given on the condition that there should be space reserved in it for 150 soldiers and a proportionate number of officers of the garrison. A subscription fund was opened and the money for the erection of the building was quickly subscribed. The foundation stone of Christ Church was laid on the 2nd of August 1843, by the Rev. Thomas Morris, Rural Dean of Dover, and Rector of St. James’s and Vicar of Hougham. Following the custom of the time there was placed under the stone a list of the subscribers to the building fund, some coins of the realm then current, and a parchment, on which was written: “In the Parish of Hougham, otherwise Huffam, in the Borough of Dover, in this County of Kent, the foundation stone of this church, dedicated to our Blessed Lord and Saviour Jesus Christ, was laid on Wednesday, the 2nd day of August, 1843, by the Rev. Thomas Morris, Vicar of the Parish. “Trustees: The Venerable Walter Augustus Shirley, Archdeacon of Derby; John Pemberton Plumptre, Esq., M.P., of Fredville, in the County of Kent; John Hardy, Esq., 3, Portland Place, in the County of Middlesex; the Rev. Thomas Bartlett, M.A., Rector of Kingston, Kent; and Alexander Gordon, Esq., 37, Old Bond Street, London. Architects: Messrs. Scott and Moffat. Builders: Messrs. John and Parker Ayers, Dover.“ The building and furnishing of the Church occupied ten months, the consecration by the Archbishop of Canterbury (Dr. Howley), taking place on the 13th of June, 1844. The petition for consecration was presented to the Archbishop by the Rev. John Ellison Bates, M.A., the first incumbent (styled "perpetual curate“) who, at the conclusion of the ceremony of consecration, preached the first sermon from these words: “Will God indeed dwell on the earth? Behold the heaven and the heaven of heavens cannot contain Thee; how much less this House that I have builded?“ After the service in the Church, the Archbishop proceeded to a tent, erected in the churchyard, and consecrated the land enclosed round the church, as a burial ground, although the Inter-mural Burials Law subsequently stopped it being used for that purpose. Only two or three burials took place in the churchyard, therefore, including those of the first incumbent and his wife. For the building and endowment of this church, £4,600 was subscribed, of which £1,100 was invested as an endowment, and £3,500 spent in levelling the land and erecting the building. The original plan provided only one gallery, that across the west end; in 1848, the south gallery was built for the poor, and in 1851 the north gallery was erected by the incumbent, the two adding about £300 to the cost of the building. The massive carved oak communion table was the gift of Mr. John Finnis, the chairs the gift of Mr. R. N. Docker, the communion plate the gift of Mr. J. P. Plumptre, M.P., carpeting and other furniture the gift of the Countess of Effingham, and the font was presented by Mr. J. E. Youden. Ladywell, nearly 100 years ago. By then a widening of the previously narrow lane had already taken place. Until 1867 it was only 14ft wide, cobbled, and had a drainage gully running down the centre. At that time the lane was one of the boundaries of the town. Beyond it was open fields and the villages of Buckland, River and Temple Ewell. 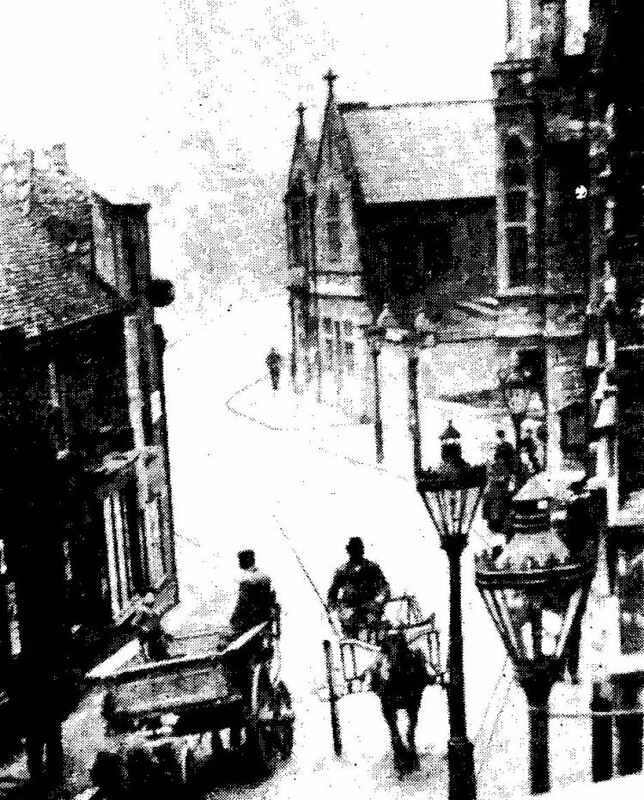 In 1867 the lane was widened to 20ft but it was still extremely narrow at the High Street junction as may be judged from the picture above which is a view looking down Ladywell from the main street. Consequently another widening became necessary in 1893, involving property on the side opposite the Town Hall, between the Sir John Falstaff public house and the High Street corner. 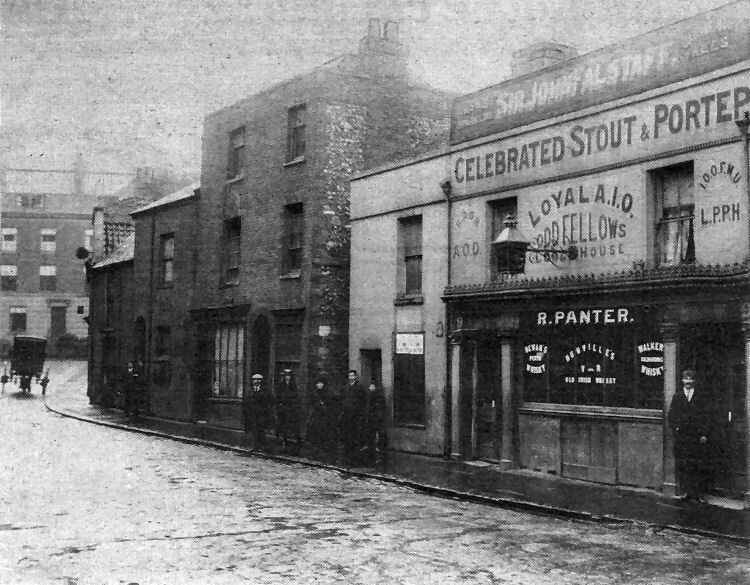 The public house was rebuilt in 1903 and the High Street corner premises in 1907. An interesting feature visible in the original picture is the line of railings of the front gardens of properties facing Ladywell and the Town Hall, known as St Martin’s Terrace, which were in domestic occupation when the photograph was taken. These short gardens were removed when the Corporation widened High Street in 1903.